I wanted to practice listening skills with Santino. I find, that a lot of times my voice is more like a white noise to him, I have to really come close and turn his head to me and repeat the same thing over and over for him to catch what I want from him. Now, this is not always, many times he hears me and does what I say, so I know this is not a hearing issue. I just wanted a simple and fun activity, that I need to explain and he needs to understand and then follow the instructions. Mystery bags seemed like a good idea. I used 2 paper bags, which I picked up from the airplane on our last trip. They are the perfect size and are not see-through. 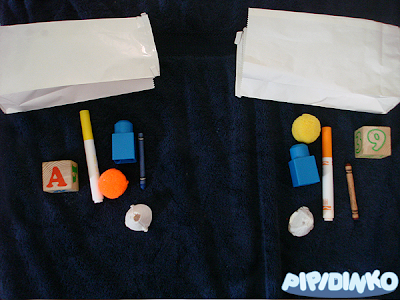 I filled the bags with a few random objects from Santino's play room, that can come in the same size and shape: blocks, markers, crayons, pompoms, etc. I showed these two bags to Santino. He immediately proceeded to grabbing one, but I didn't let him, and took time explaining that these are mystery bags, and he can't look inside. So finally he was calm enough to take a bag without peeking. I started taking the objects from my bag and told Santino that he should not look, but try and find the same object in his bag. He pretty much aced this whole activity. When he listens and takes time to think and concentrate, he does everything perfect! 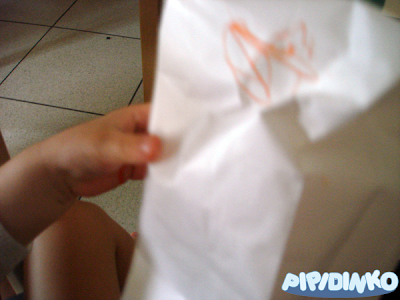 Then he wanted to play with his paper bag, by drawing a "dinosaur" on it and using it as a hand puppet. 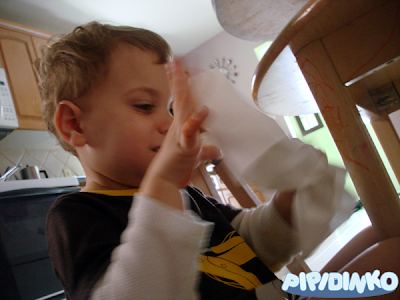 Then he discovered the funny crumbling noise when you squish the paper bag. So, he wanted to do this a few times. Yay, sound! 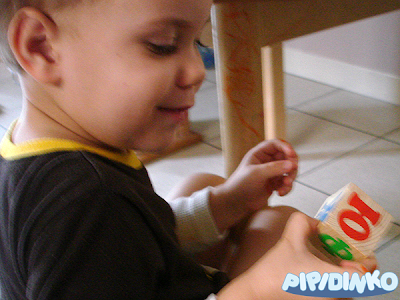 This is also a sensory activity. Check! Then Santino suddenly told me, that he found a rainbow! 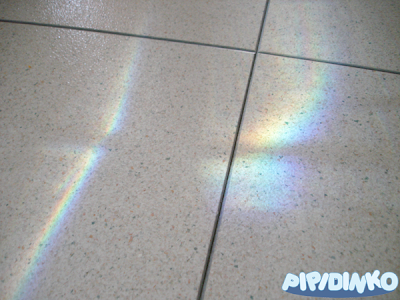 Indeed, there was a rainbow on the floor. 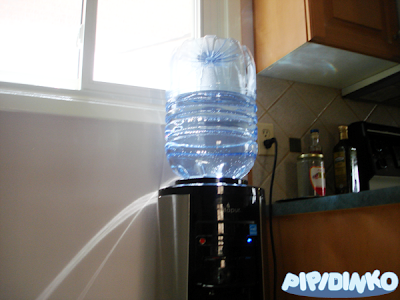 We wondered where it came from, and I figured that a Sun ray was shooting through the water cooler bottle, which acted as a prism, and created a rainbow for us. 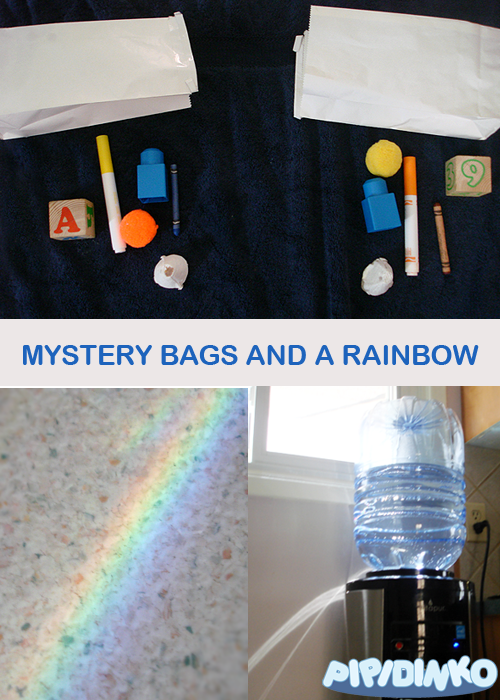 I explained the Sun ray thing to Santino, and then we played with the rainbow, practicing our colors. So fun! 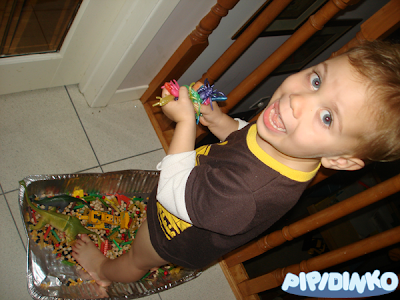 And this is Santino' favorite torture, ahem... this is how he likes to play with his sensory bins: by standing in them!